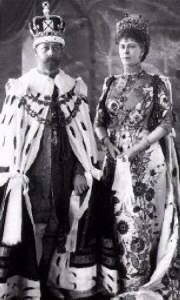 Their Royal Highnesses the King Emperor George V and Queen Empress Mary at the 1911 Delhi Durbar. They were the first British sovereigns to visit India. Consequently, they were the first and last sovereigns to be crowned Emperor and Empress of the Raj in India. 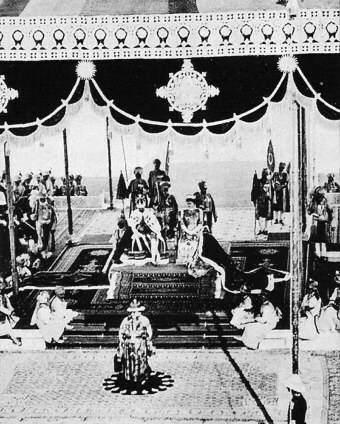 Their Imperial Majesties the Emperor George V and Empress Mary seated on the imperial thrones while they receive allegience from five hundred plus Princes of Royal India. In 1905 Prince George and Princess Mary (They were then the Prince and Princess of Wales) visited India to represent the King Emperor Edward VII and Queen Empress Alexandra. During this four month visit the future Queen Mary fell in love with India. In 1947 when the British lost the Jewel in their crown Queen Mary was quite disturbed and said to have commented that after her death if one is to look at her heart INDIA would be on it. 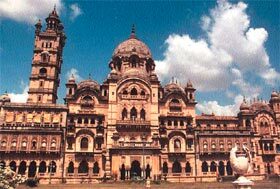 The Laxmi Vilas Palace of Baroda. This is the childhood home of Maharani Indira Devi, the Rajmata's mother.